BULLETINS OF THE SERVING LIBRARY continues the trajectory begun by DOT DOT DOT, our previous house journal which ran for 10 years and 20 issues. 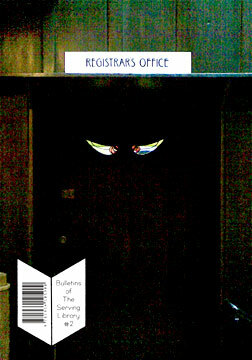 Both past issues of DDD and future issues of Bulletins are all available through Dexter Sinister's Internet Book Shop. This issue grew out of two physical incarnations of The Serving Library in 2011. The first took place from July 4–August 10 in the Walter Phillips Gallery of the Visual Arts department at The Banff Centre, Alberta, Canada. Here we set up a model of the library’s projected interior to house a six-week summer school titled From the Toolbox of a Serving Library. The school comprised daily morning seminars, supplemented by a few evening events. Each week was based on a specific component from a (Photoshop-proxy) digital software toolbox, in order to reconsider what a contemporary (Bauhaus-proxy) Foundation Course might most usefully comprise. The second opened on October 29 and at the time of writing remains installed at Artists Space, New York. Here the same model serves more as a mini-expo in view of an eventual fixed home, alongside a parallel three-screen projection concerned with "Identity." Bulletins this time around come from David Reinfurt, Stuart Bailey, Angie Keefer, Dimmi Davidoff, Julius Koller, David Fischli & Peter Weiss, Rob Giampietro, Anthony Huberman, Junior Aspirin Records, Perri MacKenzie, David Senior, and Jan Verwoert.